Joining Friends of Nevis guarantees that we can carry on doing what we do best; looking after the unique landscape of Ben Nevis and Glen Nevis. If you care about this wonderful environment and landscape, show your support and join our organisation. We offer many different membership packages which you can learn about in our downloadable information sheet. 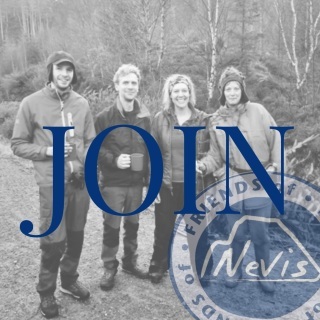 Why not download our printable membership form or head to the shop now and become a Friend of Nevis today. Our handy downloadable form offers the option of making your membership a recurring annual payment via standing order. Not only does this ensure continuing support for our projects & the area, it makes being a Friend of Nevis a hassle free process for you with only one form and no hidden costs. Friends of Nevis members can enjoy benefits such as 10% off in outdoor retailer Cotswolds located in Fort William High Street and should you be travelling to visit the area or attend an event you can contact Glen Nevis Camping to discuss a members rate. DOWNLOAD OUR PRINTABLE MEMBERSHIP FORM TODAY! Gift Aid is a government scheme enabling registered charities to reclaim tax on a donation made by a UK taxpayer, effectively increasing the amount of the donation. Joining Friends of Nevis through Gift Aid means charities can claim an extra 25p for every £1 you give. It won’t cost you any extra. By clicking the "JOIN + GIFT AID" box you agree that we can treat your donation & any donations you make from the date of this declaration, until you notify us otherwise, as Gift Aid donations. Alternatively, you can join Friends of Nevis and choose not to add Gift Aid, either way we are extremely thankful for your generosity and support. I'm a Friend of Nevis!